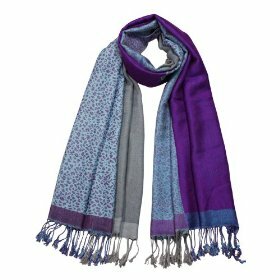 Double-sided four colors solid and leopard design scarf, with gorgeous color combinations and tassel ends. This animal pritn/solid combo scarf is great for both men and women. The possibility is endless on how you can wear this scarf. The scarf measures 28*71 inches (79 inches with fringe). Soft and shining as silk and warm as wool. The unique design suits for all purposes from casual to formal wear. It also makes a great gift for your friends and loved ones. Machine or hand wash.
* Available in 4 colors: Blue, Magenta, Purple, and Orange. For more images, click “Buy Now”.